Obviously, for anyone on Twitter these days (especially for those people with business accounts) getting more followers is often one of the key objectives. Not to mention that social media really can’t be ignored as part of a comprehensive digital marketing strategy. But followers don’t just show up out of the blue. So where to begin? First of all, make sure to customize the design of your Twitter page by going to your Profile page and then to Edit profile. 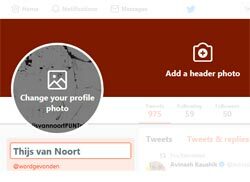 The header photo and profile photo help to create a clear picture of what your account represents. Next to the default themes, you can also upload your own images. This helps to bring your account in line with any website or blog you might be managing. The value of a consistent brand experience is still very much underrated, so definitely a way to distinguish yourself. Also make sure to fill in the Bio of your profile. Your latest tweets and reactions might not mean that much to people who don’t know you yet. This is the one place you have available to say as much as you can about yourself in as few words possible. This is also shown when Twitter proposes Who To Follow to other users. Following other Twitter users usually automatically leads to getting followers. People enjoy following you back. So it’s handy to find other users that you consider interesting or who maybe tweet about the same subject. And to follow those. People you know, but also new ones. The idea being that you’ll get followed in return. And don’t be discouraged when they don’t immediately do so. In the long run it’s not about the 1:1 relationship but about getting noticed and appreciated for what you share. The idea behind social media is that it’s a place for interaction. This is largely the appeal it has to users. Don’t treat your Twitter account as an alternative RSS feed where you can dump your blog posts or corporate press releases. While this is actually made even simpler by applications like, for example for WordPress, the WP Twitter Auto Publish plugin, it remains important that you show a real online identity. Nobody likes people that only talk about themselves all the time. The same goes for only posting product offerings. Keep an eye out for interesting news from other websites as well. This keeps your timeline of tweets more diverse and shows that the value of your account is more than just a copy of your website or blog. There’s nothing wrong with encouraging followers to retweet. You can do this by adding RT Please (not on every Tweet), but even prize contests are frequently based on the number of retweets. The benefit of retweets is obviously that you reach more people with your message and in the end more people click through. Another way to get retweets is by also retweeting others. A good variation of this is by retweeting with an additional comment. This way the tweet gets the structure <comment> @user <original tweet>. Sticking to the theory of Cialdini, reciprocity works the same way online as it does offline. Don’t just do this when they refer to your account or website, but whenever they offer interesting news. And are therefore interesting to your followers. Put some thought into what is worth sharing and think big! 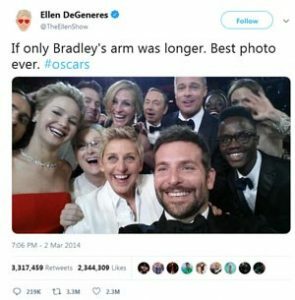 Like the famous picture posted by Ellen Degeners above that got over 3 million retweets (yet don’t forget to celebrate when you get over 10 at first). What is a hashtag? A hashtag (#) is the symbol you can put in front of an abbreviation or in front of one or more words (no spaces) to turn the abbreviation or word into a clickable link. By clicking it, results are shown for a search of all tweets with the same abbreviation or word in it. #FF stands for Follow Friday and offers an opportunity to recommend other accounts to follow by listing those accounts in the tweet as well. #daretoask is a handy hashtag used to get answers from Twitter about a broad range of subjects. Hashtags with an above average popularity (often temporary and in large volume) are called Trending Topics. These tend to align with international events like #internationalwomensday and news about international issues like #brexitdeal. To find out what’s currently trending you can check the left hand side of your Twitter profile for the latest or see more on Trends24.in. Next to Twitter itself, the same users are obviously also found elsewhere. For example on other social media sites, like Facebook. You can connect the two via your settings (Settings > Apps and devices > Facebook Connect). If you have a website or blog, be sure to add one of the various Follow @twitter images. It’s recommended to pick one of the recognizable buttons provided by Twitter itself (examples on the right). From the perspective of usability you match the expectations of users better this way. You’ve surely seen Twitter widgets around on websites as well. Either showing all tweets from a specific account or all tweets about a specific subject. While informative, there are also downsides to these. For example, when users click on a link in the widget and thereby click away from your website. Next to that, the API calls made for these widgets can seriously affect the time it takes to load your website, which has a negative effect on both the user experience and on search engine optimization (i.e. ranking in Google). Finally, make sure to also bring Twitter into the tangible world. Through business cards, flyers, posters and for example ads it makes sense to indicate your Twitter account. When giving a presentation to a customer, you could include this information on the last slide. More handy Twitter tips? Share them below in the comments!